The Cristeros movement was a counter-revolutionary reaction of the Mexican Catholic people to the severe anticlerical laws emanating from the Constitution of 1917 under President Calles. It sought to secularize the country and remove the influence of the Catholic Church. Laws were enacted that severely restricted the clergy's political activities, expelled foreign priests, closed the Catholic schools and seized Church properties. Later, churches were closed and the Mass forbidden. The popular uprising against the Calles government began in Jalisco in the city of Guadalajara, on August 3, 1926, when some 400 armed Catholics shut themselves up in the Church of Our Lady of Guadalupe. They were involved in a shootout with federal troops and surrendered only when they ran out of ammunition. 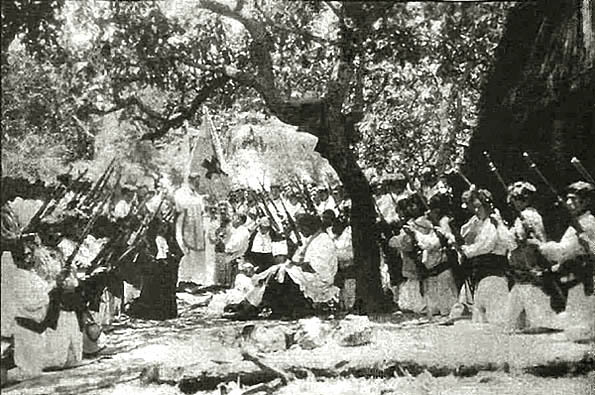 Jalisco became a focal point of the Cristeros counter-revolution. The Cristeros' battle cry was ¡Viva Cristo Rey! ¡Viva la Virgen de Guadalupe! ("Long live Christ the King! Long live the Virgin of Guadalupe!"). The prayer below was said by the Cristeros of Jalisco at the end of the Rosary. My Jesus Mercy! My sins are more numerous than the drops of blood that Thou did shed for me. I do not deserve to belong to the army that defends the rights of Thy Church and that fights for her. I desire never to sin again so that my life might be an offering pleasing to Thy eyes. Wash away my iniquities and cleanse me of my sins. By Thy Holy Cross, by my Holy Mother of Guadalupe, pardon me. The Cristeros II: Long Live the Virgin of Guadalupe!